Do you think banking is too hard for you? Are you convinced that all bankers are crooks? Would you like to follow the financial news, but you always get stuck on terms like derivatives, cryptocurrency or quantitative easing? Then I have some good news. 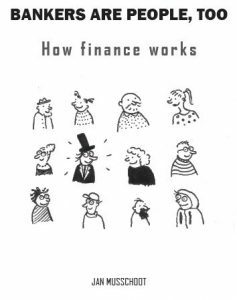 Bankers are people, too is an introduction to finance. Everything is explained from scratch. It doesn’t require any prior knowledge of economics. The book gives a big picture overview of the financial industry. It shows banking in all its aspects, from the regulators in Basel to the offshore banks on the Bahamas. The role of politics and crime in finance is not taboo, but an integral part of the story. You can buy Bankers are people, too on CreateSpace. It’s also available on Amazon.com, Amazon.co.uk and in continental Europe, e.g. Amazon.fr. Use the Look Inside feature on Amazon to have a look at the table of contents. Previous Previous post: Book news!